Home › 2 In 1 Bonke Tongs And Spatula - Perfect Salad Fish Spaghetti Meat Steak Turn..
2 In 1 Bonke Tongs And Spatula - Perfect Salad Fish Spaghetti Meat Steak Turn..
2 in 1 spatula and food tongs in one. ULTRA EFFICIENT It is designed to grip all types of food. You will be able to use it for salads, meat, rice, potatoes and even spaghetti or noodles. RICH QUALITY made from high quality nylon, which prevents food tongs from higher temperatures, abrasion, rot and many chemicals. These 2 in 1 spatula and food tongs are strong, durable and long lasting. OUTSTANDING AND SMART DESIGN we at Bonke change the way people look at kitchen tools. We combined the best engineering and industrial design skills to bring you modern spatula and food tongs with functionality you never dreamed of. GUARANTEE full one year guarantee. Color:Grey WE ARE HERE TO CHANGE THE WAY YOU PREPARE YOUR FOOD These 2 in 1spatula and food tongs are efficient like never before. Get done a lot morewith these 2 in 1 spatula and food tongs. 2 in 1. Kitchen tongs and spatulain one High quality long-lasting nylon Designed for all types of food Dishwasher safe Easy to use Top notch design Eye-catchy packing andproduct design makes it a perfect gift idea Save Your money and buy this 2 in1 spatula and kitchen tongs instead of buying tongs and spatula separately.Now You can have two-in-one spatula and food tongs and use it as a saladtongs, appetizer tongs, turner tongs, spatula, turner spatula, or spatula set.Bonuses & Gifts 30% discount for Your next purchase inside the packageGuarantee Full one year guarantee. Special Sale Unlike FREE Bonuses and Gifts,Which Will Be Here Forever Ends Soon! Dont Waste Time! 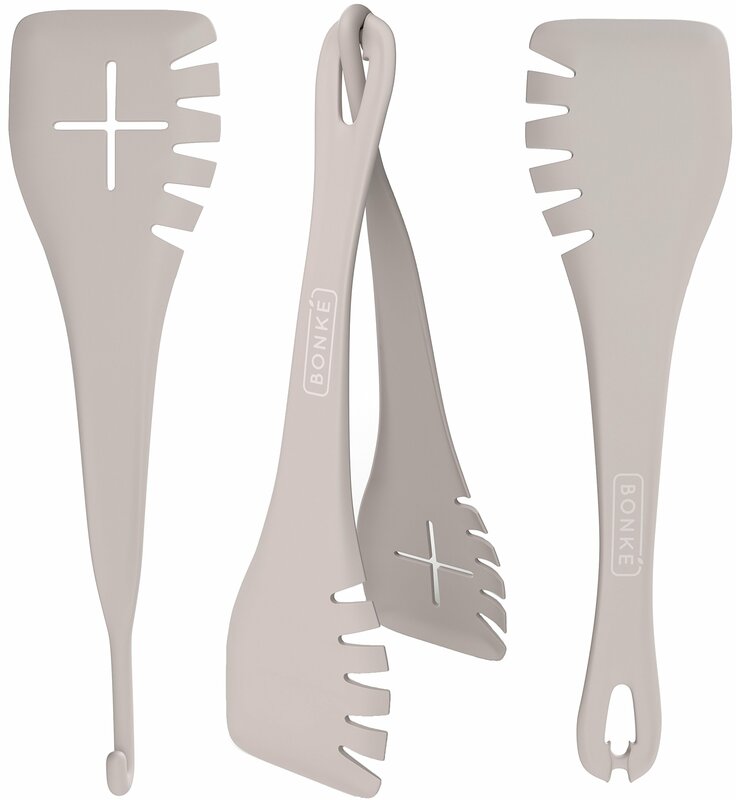 Add Bonke 2 in 1Spatula and Food Tongs to Your Cart Immediately and Receive it ASAP WithAmazons Fast Delivery Service!